A Pittsburgh-area artist commemorates the derelict house next door, starting with a coat of paint. Briggs, a sculptor and architect, was born in Burgettstown, Pennsylvania, outside of Pittsburgh, and raised in the panhandle of West Virginia. At the age of 18 she moved to New York to pursue architecture, living in the city for nearly three decades before returning home to Pittsburgh in 2003. Her sculptures and installations, many of which utilize traditional building materials like steel, aluminum, wood, and concrete, have been exhibited at the Warhol Museum, the Mattress Factory, and UnSmoke Artspace in Pittsburgh, as well as in Chicago and New York. For the last six years, Briggs has lived in a firehouse in the small town of Wilkinsburg, which she converted to a living space and studio for her art practice. During that time, she’s watched as the vacant house next door has fallen further into disrepair. Wilkinsburg itself has been in free fall, with gang- and drug-related violence a near constant in the community; school struggles a perennial issue; the growing tax burden a drain on the dwindling population; and blighted properties cropping up like weeds. It’s a similar host of problems faced by small towns throughout Western Pennsylvania, from Braddock and Rankin to Duquesne, McKeesport, and Clairton. Last year, after deciding to buy the vacant house with the intention of tearing it down and creating a green space, Briggs was inspired by what she discovered once she stepped inside. 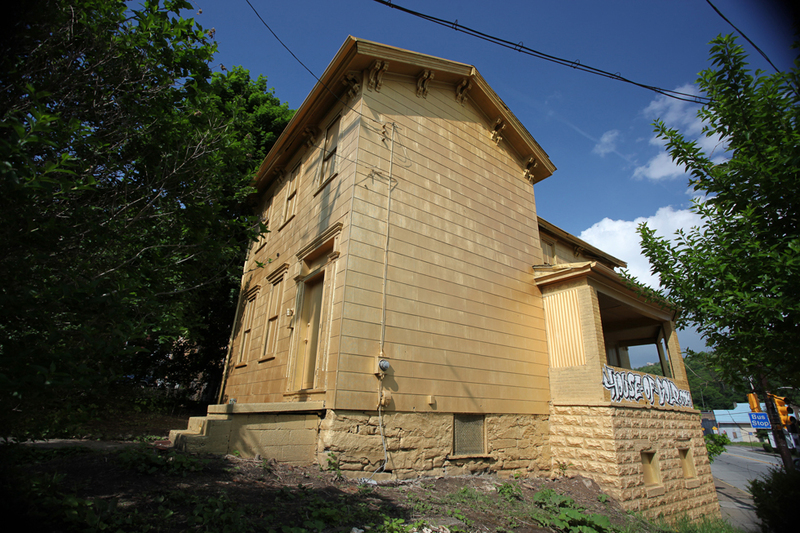 To complement the house’s newfound voice, Briggs, with the help of friends, spent a weekend in the spring painting every inch of the faded exterior a brilliant shade of gold—transforming the long-derelict structure into a beacon amid the neighborhood’s decay. Once the house was wrapped in gold, the public began to learn of its story through the House of Gold website. Briggs had never planned on saving the house, but she came to the conclusion that a regular demolition was not a fitting end for it. Instead, she decided to raise money through Kickstarter to support a “gentle demolition.” Briggs has assembled a team of like-minded builders, designers, architects, and contractors who will help her carefully take apart the House of Gold—with the goal of reusing as much material as possible to build a small coffee shop on the site. With a few days to go, she’s almost halfway to her $30,000 target. • • • • •Over the last several months I’ve corresponded with Briggs by email and also spoken with her in person, discussing the origins of the House of Gold and the strong response the project has elicited. Matthew Newton: What initially attracted you to this particular house? Dee Briggs: I tried to buy the house from the previous owner but he didn’t respond to any of my inquiries, so the borough of Wilkinsburg encouraged me to apply to purchase the house through the Allegheny County Vacant Property Recovery Program. The house was boarded up, vacant for at least the last six years. Some of the windows were smashed and there were weeds that had grown to the second floor. No one was cutting the grass, shoveling the snow, or paying the taxes. At times people were squatting in the house, and then the raccoons moved in. I was interested in the building because it is so close to my property, and it was becoming more and more of a danger as it fell further into disrepair. It took over a year to go through the county process but they condemned the building, seized it from the previous owner, and then required me to demolish it as a part of the sales agreement. Once the property legally changed hands, I went inside and immediately realized that the house was older than the firehouse—my studio and home [located next door]. Additionally, the inside was full of discarded stuff. Both facts set my mind to thinking about the lives of the people who had lived there. I’ve long had a love of buildings, and have two degrees in architecture, so it already broke my heart to be tearing down an otherwise lovely old house that had just been forgotten. That was when I realized that I had a responsibility to say something—not just about this house but about all of the houses just like it, and even more importantly, about the lives of the people who had lived in and around it. There is a direct parallel for me between this house and the young people in my neighborhood. Newton: How did the idea come about to have the house tell its story through a first-person narrative? Briggs: A friend who is an architectural historian—Charles Rosenblum—did the research for a house history for the property. He dug up all of the facts: the chain of ownership, dates, family names, and occupations. And I interviewed neighbors who’ve lived here a long time to add character to the story. I decided to write in the voice of the house because I wanted to make the abandonment and the disrespect resonate. Newton: What type of conversations has the House of Gold spurred in the community? Briggs: So far, very positive. I don’t think there is anyone in this neighborhood who is happy about rampant property decay, the drug dealing, or the regular violence and shootings. So the fact that someone has given this old house a little love seems to have made people pretty happy. Yesterday I caught three teenage girls from the neighborhood taking their picture in front of it. I take that as a good sign. And on the website there’s a place to make comments. [Some are from] friends of mine who do not live here, but most are [from] people who either currently, or previously, lived in Wilkinsburg. I’ve been delighted by the comments. Many [people] are talking directly to the house, which I love; and several just launch into their own stories. I think there’s something positive and powerful to have created this space where people can do that, where their stories mean something to someone else. Newton: Reading the comments on the website, there’s an overwhelming sense of gratitude from the public that you’ve chronicled the story of this house. Have those responses surprised you at all? Briggs: Yes. In all honesty, the project happened so quickly—from having the idea to actually completing the painting and website—that I didn’t spend much time thinking about what sorts of comments the site would get. My hope is that it leads people to think about and treat other similar properties differently. I hope that at least a few people will make the conceptual leap to realizing that all abandoned, blighted houses once housed people—people with friends and families and lives similar to their own. I don’t know if that’s realistic, but it’s my hope. Originally published by The Atlantic’s CityLab in September of 2014. Photograph: Dee Briggs Studio.